Two polemical treatises by Isaac Orobio de Castro. Amsterdam, early 18th-century copy. Respuesta a un Escrito / que presentó un Predicante Francez / a el Autor contra la observancia de la / divina Ley de Moseh. Epistola Invectiva/ Contra Prado un Philosopho Medico,/ q’ dudava, ô no Crehia la verdad de la divina Escritura,/ y pretendió encubrir su malicia com la affecta/ confession de Dios, y Ley de Naturaleza. This manuscript is the continuation of the collection of Orobio de Castro’s treatises in EH 48 C 01 and EH 48 C 02. Written in the same hand as EH 48 C 01, 02.
f. 1r-42v: Respuesta a un Escrito / que presentó un Predicante Francez / a el Autor contra la observancia de la / divina Ley de Moseh. f. 43r-147v: Epistola Invectiva/ Contra Prado un Philosopho Medico,/ q’ dudava, ô no crehia la verdad de la divina Escritura,/ y pretendió encubrir su malicia com la affecta/ confession de Dios, y Ley de Naturaleza. f. 148r-150r: Table of contents. Part I is identical with Respuesta a un tratado que escrivio vn docto/ Predicante de la religion reformada (see EH 48 A 12). Other copy in EH 48 C 12. 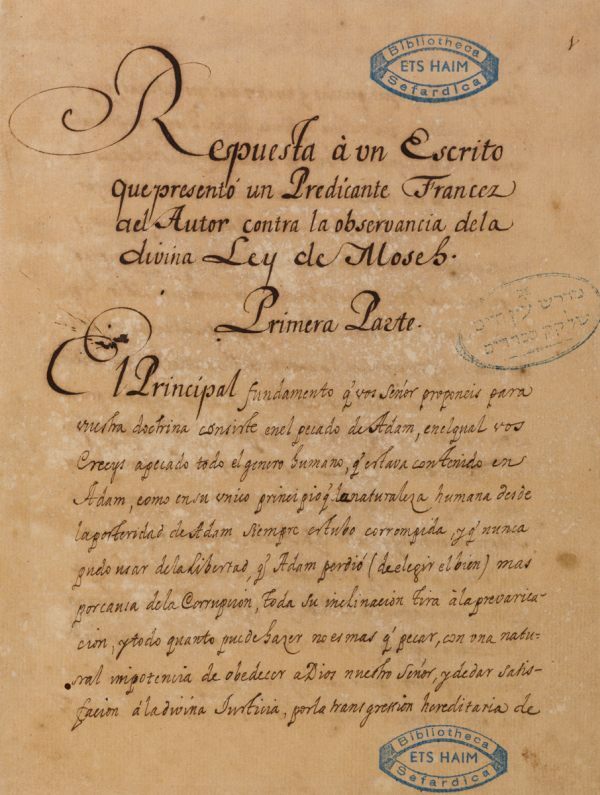 Respuesta a un escrito was written about 1670 by Orobio against a French preacher, probably a Huguenot, who had given him a polemical writing against the Jewish adherence to the Law of Moses and the observance of its commandements. The controversy between Orobio and that French preacher has two focuses: the original sin and the differences in functions of the Messiah in Judaism and Christianism. Part II is identical with Epistola Invectiva contra la impiedad, de quien duda la verdad infalible de la Sagrada Escritura…. (see EH 48 B 12), Epistola invectiva contra un Philosopho medico que dudava, o no creia la verdad de la divina escriptura… (see EH 48 A 12) and Respuesta a un Filosofo Hebreo, que pide fundamentos de razon para persuadirse, al credito de el Sacro Texto (see EH 48 C 4). Other copy in EH 48 C 12. This text was partly published by I. S. Revah in Spinoza et le Dr. Juan de Prado, Paris, Mouton, 1959, pp. 86-129. Epistola Invectiva was originally written in 1663. It is Orobio’s defence of rabbinic and Talmudic authority and of the validity of the Halakah, also using arguments based on philosophical reason, against Juan de Prado’s writings. Presented to Ets Haim Library by A.M. Chumaceiro, chief rabbi of Curaçao in the second part of the 19th century. Adam Sutcliffe, Judaism and Enlightenment, Cambridge, Cambridge University Press, 2003. Yosef Kaplan, From Christianity to Judaism: the story of Isaac Orobio de Castro, London, Littman Library of Jewish Civilization, 2004. Spanish / Paper / 23,l x 18,1 cm. / 147 +  ff. (last 3 ll. blank) / 19 lines to a page / Current Iberian writing of the early 18th century / Title written on top of f. 1r / Catchwords at the end of each folium / Contemporary gold-tooled leather binding. Fuks 220. Fundação Calouste Gulbenkian.